Photos of Little Dancie Wong and Ng Dancie Yet, affidavit, 1933, Chinese Exclusion Act case files, RG 85, National Archives-Seattle, Little Dancie Wong file, Seattle, Box 742, Case 7030/10486. Little Dancie Wong and her mother obtained an affidavit for the purpose of identification. They were applying to the U.S. Immigration authorities at Angel Island, California in 1933 for a Return Certificate, form 430, which would enable them to re-enter the U.S. after a trip to China. Ng Dancie Yet, her husband, and several white witnesses were interrogated. Some of the information from the interrogation: Henry Wong, also known as H. Wong and Wong Ge Ye, was born in Gilroy, California on 22 Jan 1908. He and Ng Dancie Yet were married in Ft. Worth, Texas on 17 April 1925. He was a merchant at grocery and meat market called Wong Company in Rosedale, Mississippi. One of their white witnesses was Dr. Charles W. Patterson, a practicing physician in Rosedale and a graduate of Tulane University. He delivered the Wongs’ three children: Pershing, born in 1926; Kellogg, born in 1928 and Little Dancie, born in 1931. G. W. Heckert, the Immigration Inspector reviewed the Wongs’ marriage certificate and noted that it was recorded in the Ft. Worth, Texas 1925 marriage records, volume 58, page 242, number 59881. Heckert asked if they could keep the certificate in their permanent files. Ng Dancie Wong refused and the certificate was returned to her. She stated that she was born 18 January 1905 at Fort Worth, Texas. During Ng Dancie Wong’s interrogation she was asked if she was “an expectant mother.” She said that she was four or five months pregnant. Ng Dancie Yet was also known as Ng Yook Hong or Mrs. H. Wong. 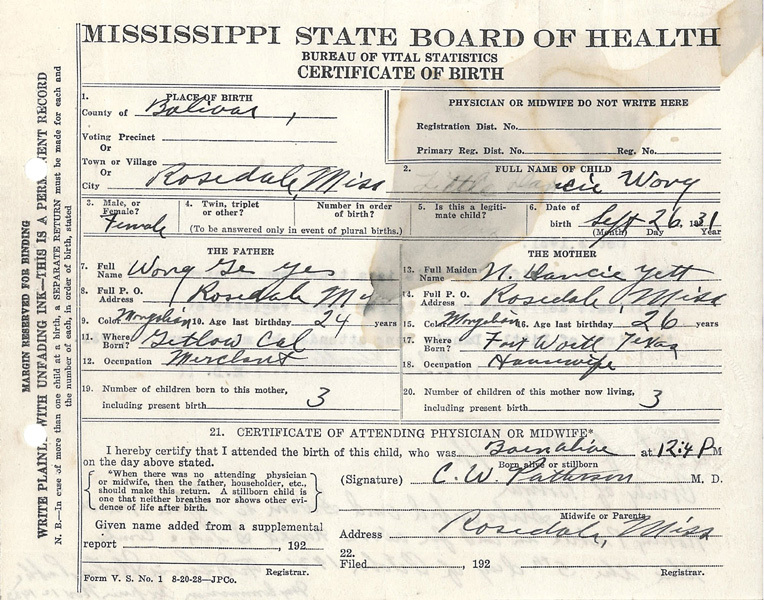 Little Dancie Wong, Mississippi Birth Certificate, 26 September 1931, Chinese Exclusion Act case files, RG 85, National Archives-Seattle, Little Dancie Wong file, Seattle, Box 742, Case 7030/10486.